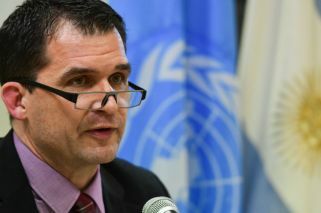 Report by Nils Melzer, United Nations special rapporteur on torture, calls for minimum penal sentences for non-violent offenders and demands government dedicate adequate resources to investigating crimes against humanity. “There is a state of emergency in these prisons. It is unacceptable and [it] needs to be addressed,” Professor Melzer declared at a press conference held in the UN’s offices in the City neighbourhood of Recoleta. The UN representative called on the nation’s leaders to “act now” and said the Judiciary should only enforce minimum penalties by law for non-violent offences. For decades in Argentina, succeeding administrations have been unable to improve the deplorable conditions seen in some of the country’s prisons. Melzer said he believed the last military dictatorship (1976-1983) was partly to blame for the current difficulties. “The oppressive military architecture of the past has survived within the security and prison systems and, under the guise of public security policy, [it] risks leading the country back down a slippery slope towards a more divided society marked by increasing indifference arbitrariness and abuse,” he said. The UN official noted how the situation had progressively deteriorated, with toughon- crime policies leading to increased incarceration levels, without any improvements in the current prison system having been made. “There must be willingness to act now. People cannot live in these conditions. There must be a sense of urgency. It is like a burning house,” said Melzer. In recent years the number of female detainees had increased disproportionately, with 70 percent affected by new repressive policies that target small-time drug-trafficking offences with jail terms. These new policies, in combination with a new federal law that prevents early release on parole, could lead the overall prison population to jump by 40 percent, the UN official warned. Melzer also underlined how an “average of 60 percent of persons deprived of their liberty in prisons and police stations are in pre-trial detention,“ and that in many situations it can take judges up to five years to resolve a suspect’s case. He urged legislative authorities and the Judiciary to take additional action to ensure that only the minimum penalty be given for non-violent offences such as small-time drug violations, and to refrain from reducing the minimum age for criminal penalties. “I urge the judicial authorities to make use, to the maximum extent permit ted by existing law, the application of measures and sanctions alternative to detention,” he said. During his evaluation, Melzer said he had received many reports of institutional violence carried out by security forces and penitentiary officials. He said the claims implied such behaviour was widespread and provided evidence of a climate of impunity. He offered many accounts in his report of how federal and provincial security forces had violently beaten prisoners who were physically restrained. Many victims alleged that they were subjected to multiple types of torture, such as the use of suffocation techniques. “I remind [the] authorities that any unnecessary, excessive or otherwise arbitrary use of force by law enforcement officials is incompatible with the UN Basic Principals on the Use of Force and Firearms and the UN Code of Conduct for Law Enforcement (1979),” Melzer said. The UN official observed that a climate of fear was evident during many of his visits to the country’s police stations and penitentiary centres where prisoners are held, with the most notable report coming from Cruz del Eje provincial prison. There, penitentiary officials reportedly severely beat prisoners while they are chained to beds. Melzer, however, offered praise for the access he was granted, as well as paying credit to the numerous federal and provincial bodies that have created in recent years with the aim of preventing torture. The UN official highlighted how Argentina was one of the first to ratify the Optional Protocol for the Convention against Torture (OPCAT) back in 2004. Melzer also pointed out how it was not until President Mauricio Macri’s administration took office that the government designated officials to form part of the National Prevention Mechanism of Torture. “Fourteen years after the ratification of OPCAT, the preventative monitoring system required by the treaty still does not exist in practice for the vast majority of persons deprived of their liberty,” he said. Despite the progress being made, funds still haven’t been allocated to the organisation, he added. Melzer also lauded the creation of the Office of the Special Prosecutor for Institutional Violence. However, after interviewing alleged victims of torture, he observed that the victims’ complaints were rarely investigated. “There is a significant gap between the number of complaints filed and the investigations carried out, resulting in a pervasive culture of impunity among security forces and prison staff,” said the UN special rapporteur on Torture. Addressing trials for crimes against humanity, the UN official urged the government to continue providing the necessary resources to ensure legal processes continue. Over the past two years, there have been several cuts to investigative teams that helped gather evidence for the prosecution. Melzer called on Macri’s administration to continue supporting these investigations, to prevent impunity and to aid the redress and rehabilitation of the victims. Melzer spent 11 days in Argentina from April 9-20, meeting with high-ranking federal and provincial officials and had travelled to the provinces of Buenos Aires, Córdoba and Formosa to inspect prison and juvenile detention centers, psychiatric wards and indigenous communities. His final report will be presented to the United Nations Human rights council next year.